Little Cheverells Montessori School lay back from the lane behind a Horse Chestnut tree and hawthorn hedgerow sprayed with white flowers. Having started a diploma course at the London School of Modern Montessori, I was visiting the school to learn more about child-centred early education. Mrs Smith greets me warmly. At one end of the room a little boy, no more than three years old, washes his hands in a low basin and cleans his nails with a child-size brush. He is deep in concentration. Seated at a low table, a girl polishes a silver jug and inspects it closely. 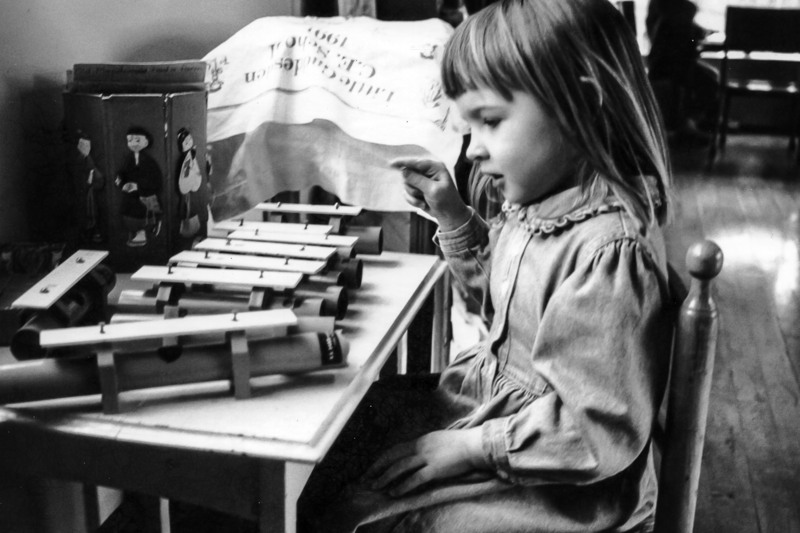 A boy bends over a tray as he works to restore the pattern engraved on its surface, and a girl buttons up gingham fabric on a wooden frame. 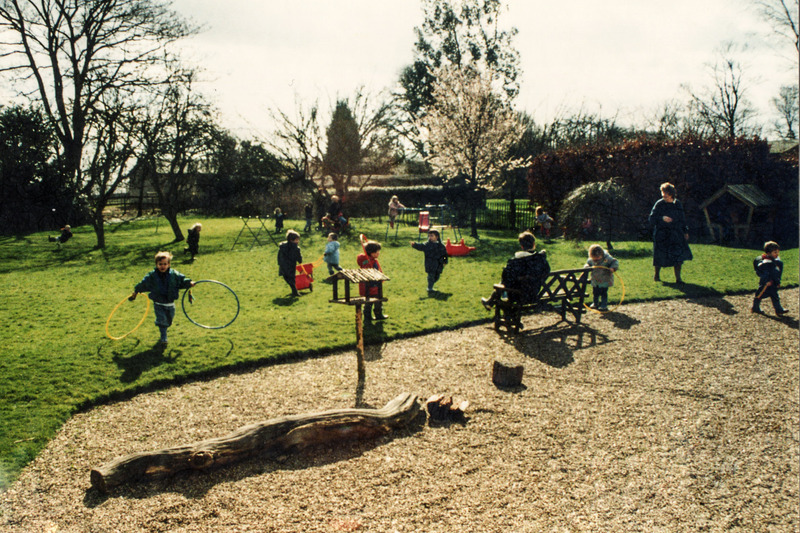 This is the Practical Life area where children learn to care for themselves and their environment. Other children work on mats on the floor, building the Pink Tower or lining up the Number Rods. They work for as long as they want; there is no schedule. In the book corner, a teacher reads The Very Hungry Caterpillar. Catherine is putting on an apron at the easel and Tom is looking at frogspawn collected from pond dipping yesterday. In the adjacent room, large windows welcome the sunlight. Daisy draws carefully around a rectangular template then she copies the pattern of a flag she has chosen and cuts it out. Children learn pencil control this way. Olivia sits cross-legged on her mat. She traces the tactile ‘H’ of a sandpaper letter as she makes a “huh” sound, before placing a miniature hat next to the letter. 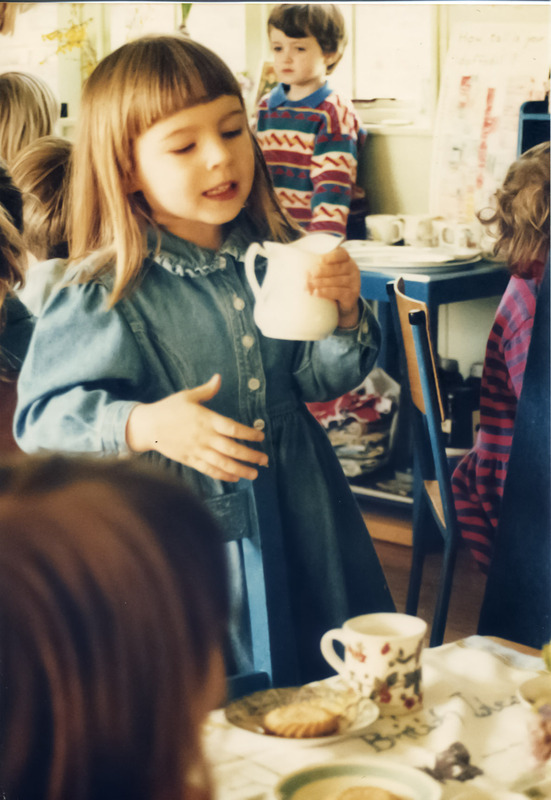 At break time, children place a tea cloth and a vase of flowers on each table then they form a queue, waiting their turn to choose a small china cup and saucer that they carry to the table. Mrs Smith sits at the piano. “Who’s passing the apple around?” she sings as her fingers dance over the keys. I left that day believing children learn best in an environment that lets them develop in their own time. From 2½ until 4 years of age, Alex enjoyed her morning sessions while I worked there as a part-time assistant. Watching children grow in confidence and independence was an unforgettable experience. Dr Maria Montessori’s philosophy influenced us at home too. The table and chairs pushed to one corner, our small dining room became our Montessori room with pictures of nature on the walls, home-made sandpaper letters and a collection of miniature objects. We collected books on geography, history and nature and kept them on a low bookshelf. 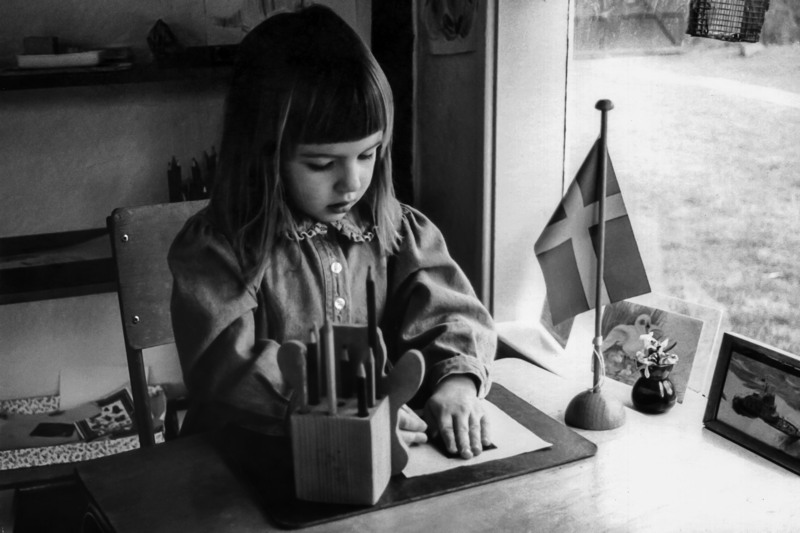 In their early years, our children developed a love for learning. We watched and guided them through the years as they grew into conscientious, independent young adults. It’s been an amazing journey in education, and we watch and learn as they continue to learn!